Finding an affordable and reliable removals provider in London might sound tricky, but there’s one company that covers both. Aussieis the ‘can-do’ removals and storage company, and we operate all over London and the surrounding areas. Our Man & Van service is the most popular of its kind in the capital. And we help move thousands of people in London every month. Aussie Man & Vanservice is the most popular of its kind in London for several reasons. If you’re moving from one area in London across the city to another, a man and van service is the most suitable option. That’s because the smaller vehicles are more straightforward to park in the densely populated parts of the capital. This makes it simpler to pack your possessions into the van and to manoeuvre around any stationary cars. Your neighbours will also thank you for not blocking the road with a large van. Aussie Man & Van charges by the hour for this service, which works out much cheaper than other companies who apply day-rates. You should only pay for the time your relocation takes, which is why we use an hourly rate. Every man and van booking come with two members of our expert removals team who will assist with packing, creating an inventory and doing all the heavy lifting. Aussie’s Man & Van service is the best in London, and we relocate thousands of people every month. If you’re moving from a three, four or five-bed house, it’s likely that our Removals serviceis the most suitable course of action. Aussie has a range of removals vans to choose from which makes it possible for us to do any removals job. And sometimes, it makes more sense to try and pack and transport all your belongings in one trip. Our Removals service works well for larger pieces of furniture, lots of appliances and more significant volumes of items to relocate. We have various sizes of removals vehicles at our disposal, as well as the best removals equipment and tools. 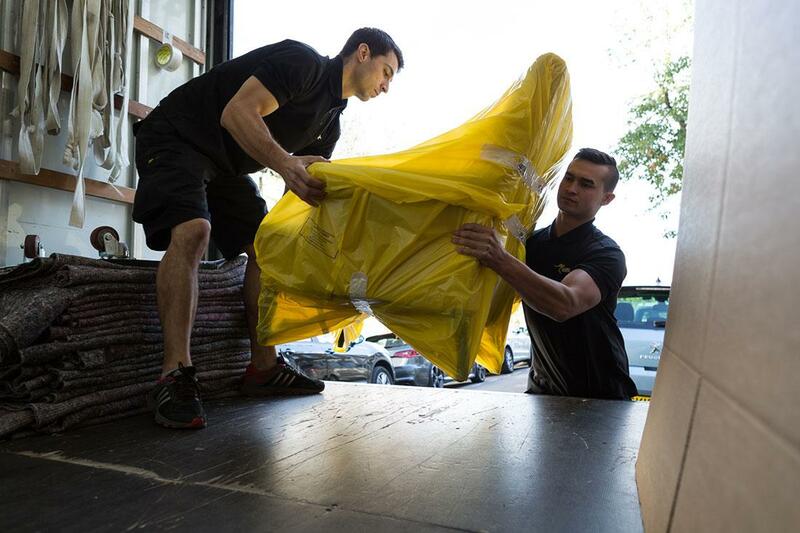 In addition to your removals services, Aussie has three storage optionsat all our facilities in London, Surrey and Bath. Aussie Cleanis our professional cleaning company that specialises in all domesticand businesscleaning services. At Aussie, we take a great sense of pride in the knowledge that we relocate tens of thousands of people every year in London. We have five branches in the capital and one facility in Bath,which is all part of why we’re London’s fastest growingremovals company. Aussie operates and serves every area in London, Greater London, Surreyand all neighbouring counties. We often relocate someone from London to Twickenham. And when they start planning their next move, they contact us. For us, customer serviceis of paramount importance, and we base all our packages and services on this ethos. Aussie is the ‘can-do’ company that aims to exceed your expectation and help you move into your new home, stress-free. If you’re planning your next relocation in London, contact ustoday. One friendly staff are always available to discuss our range of services.